Description of "Anders Zorn: 124 Paintings in Colour"
Anders Leonard Zorn (1860 –1920) was Sweden’s artist who obtained international success as a painter, sculptor and printmaker in etching. His fame abroad is founded mostly on his portraiture where he had the ability to capture the character and the personality of the depicted person. But also his graphic work, where he is among the most talented of all times, is well-known. Known as the "Swedish Impressionist", the painter Anders Zorn is best known for his alfresco nudes. These female figures were mainly depicted outdoors, using the plein air painting technique, often by the sea and in natural light. He strove to reflect a synthesis between nature and the human body manipulating paint onto canvas with rapid brushstrokes. His works were particularly popular in America at the time of his death, his prints sometimes selling for more than those of his mentor Rembrandt. Paintings by Anders Zorn can now be seen in several of the best art museums around the world. 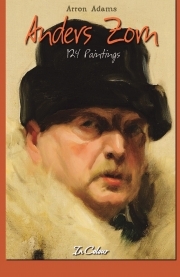 Reviews of "Anders Zorn: 124 Paintings in Colour"